There have been 244 images uploaded to this topic. (View topic image gallery). There are 1945 posts in this topic. You are on page 39 of 39. I thought the same thing about my pro after playing a LE on location. I had noticed that flasher going off quite often on the LE, and after thinking about it I couldn't really remember if it was even there on the pro. Went home and confirmed that there was actually a light there, although the LE light cover is blueish instead of yellow, and possibly a little taller. I fired up a few games, and confirmed that it does work the same on my pro, however the plastic cyborg cut out on the pro obstructs the light much more than the cyborg toy figurine on the LE. Of course that doesn't mean yours isn't working properly, just thought I'd point out my findings. is the an LE/Premium? if so likely captive balls. Put the game into switch test and you should be able to see what's causing it quickly. It’s an LE, and I called Chaz at Stern since I’m also having other problems with it(erratic shooter lane), and yes-it was the spoon being too tight against the captive ball stick. 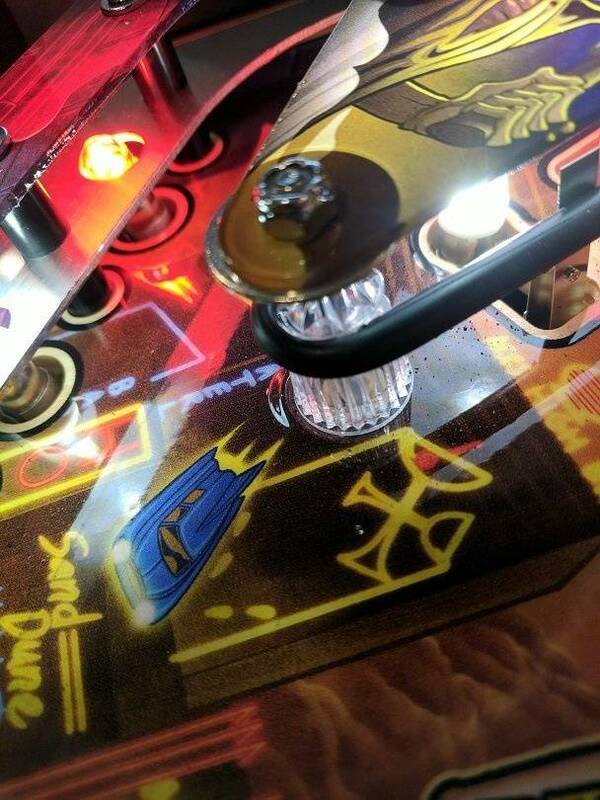 Doesn’t it flash when you have a current combo shot running? Here are two slomo videos. My guide looks exactly like this, and i'm having the same exact problems. I don't have a grinder to polish it down, so I will have to find another method. 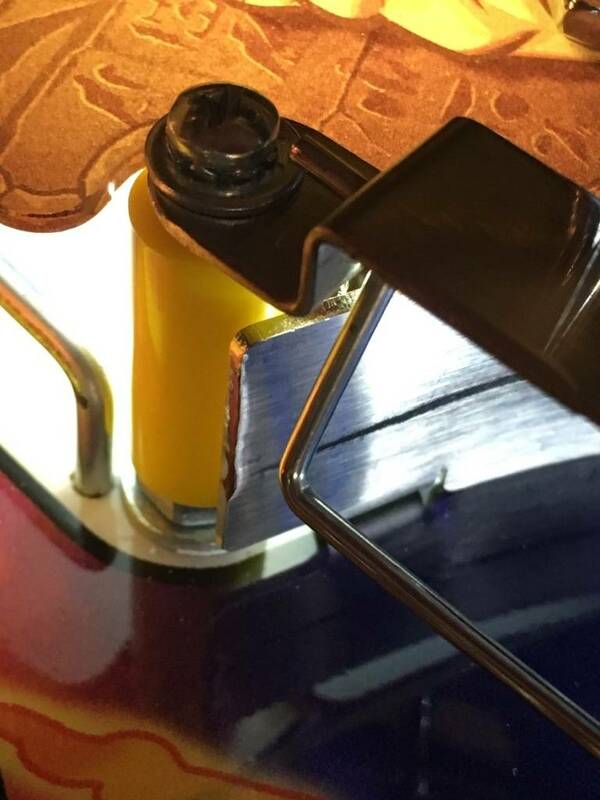 A question I have (I know this is going to sound ridiculous): How do you adjust the ball guide without bending it? Bare in mind, I'm a real simpleton when it comes to crap like this... Chose the right hobby, didn't I? 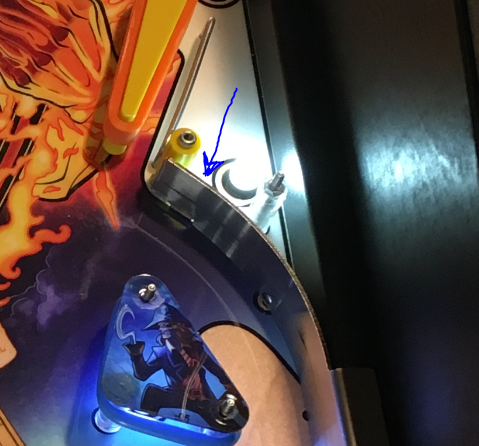 There is a screw holding the top part of the guide to the playfield, via a tab. You have to remove the gate and plastic to get to it. Then loosen it up and adjust the guide, re-tighten. It's right on the other side of the guide where I have the arrow in this pic. Get a dremel tool kit. 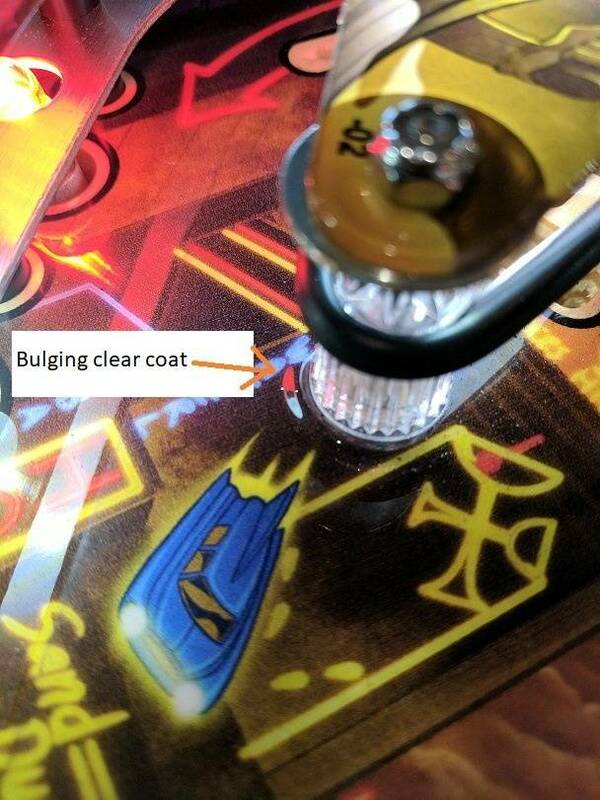 Pretty much mandatory for general pinball tasks that come up. This bump grinding can be its coming out party. Its the utterly shite design of the captive ball. You need to adjust it until it works, read the rest of the thread. I finally had a chance last night to take a look at the captive ball. Sure enough the actuator rod had come un-screwed ever so slightly causing the sensitive switch activation. I noticed mine has the older rods that are just beveled at the bottom and not the more pointed ones. Are the ones with the point that much better? Should I contact Stern to see if they will send them to me or should I just go ahead and put some blue loctite on my current ones and roll with it? The new pointy tip actuator shafts that Stern sent me are still in the bag. I have the original ones gapped correctly and they perform just fine. I've not had any reason to replace them. Blue loctite will address the unscrewing issue. Spend time on accurately gapping the switches and you'll be ok. This is the first I've had problems with either of mine and they registered great prior to this. When I tightened it last night I adjusted the gap and it's working great again, for now at least. I will go ahead and add the blue loctite. It sounds like you already did this. 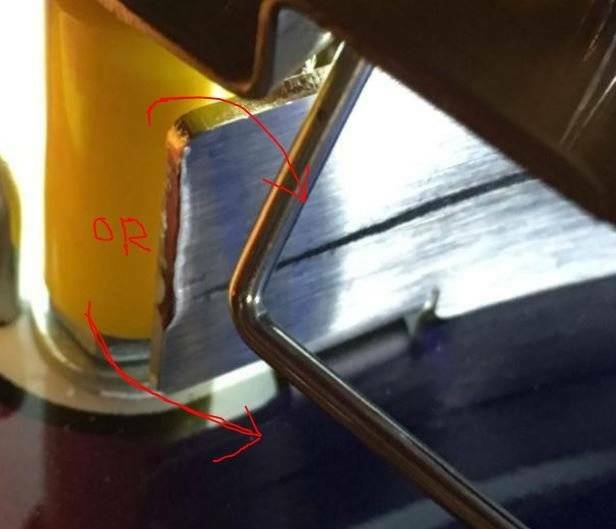 Are the threads long to where I should unscrew the switch to prevent bending it out of adjustment when I go to unscrew the rod to add the loctite? I installed the pointed actuators and think they do work better than the round ones. Not a great deal better, but better. I've not added loctite, yet. The mummy spoon switch shaft never loosened and has been working flawlessly. I only tightened it by hand (firmly) when I first gapped the switch 10 months ago. The jackpot/orb switch shaft does loosen up on occasion. When this happens you'll notice the song is pre-selected as soon as ball1 is fed to the shooter lane - or the pop bumpers activate it mid game. To resolve this I reach into the cabinet through the coin door and tighten it by hand. It worked the first time and I've done it a few times since. This lasts about 50-100 games - ymmv, but I wouldn't take this approach outside of a home environment. I only have red loctite so I'll admit to being lazy in this regard. When I remember to buy some blue loctite I will apply it to the 3 or 4 turns of thread that are exposed when you loosen (but not remove) the shaft. It would be great to incorporate a set screw into this design instead. I'd bet this to be true. In my case I adhered to "if it ain't broke..." way of thinking. If both switches (Prem/LE) were acting up, I probably would have upgraded to the pointy ones at that time. I replaced the balky sarcophagus switch with a roller switch--problem solved. Added the stronger auto fire coil, and that does make a difference. Why Stern doesn't use these items to begin with is lame, lazy...and cheap. Have you removed it? The sleeve isn't straight, it's tapered, so orientation matters. Does it move freely if you raise and lower it by hand? 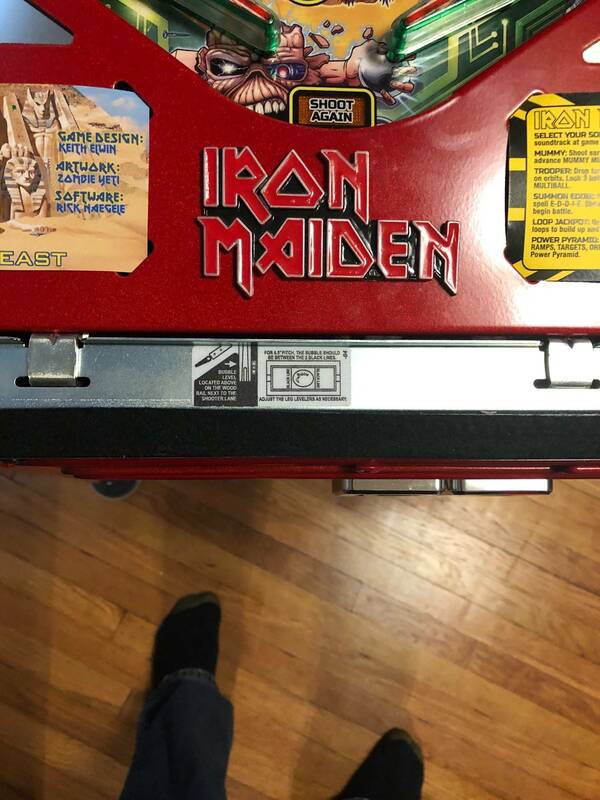 How old is this machine? Pull the black sleeve off...then wrap one turn of electric tape around the metal post, then slide the black sleeve on over the tape. fixed! Yes. Check the angle of your machine (is the PF at least 6.5 degrees?). If that's not it, just angle that little pathway a tiny bit to provide more downward angle to encourage a slow ball to move forward and out. Have any of these more common recurring issues been addressed by Stern on the later run games? Deciding between Pro and Premium. I was having the same issue with the sleeve sliding up and blocking the ball. I did the exact same thing as Pinzzz (wrapping 1 turn of electrical tape around the post and sliding the sleeve back on) and it works perfectly now. No issue in 2 months. Very simple fix. Go to Amazon and buy a digital inclinometer. The level tube on your game is inaccurate. There are tools you can get to measure it. 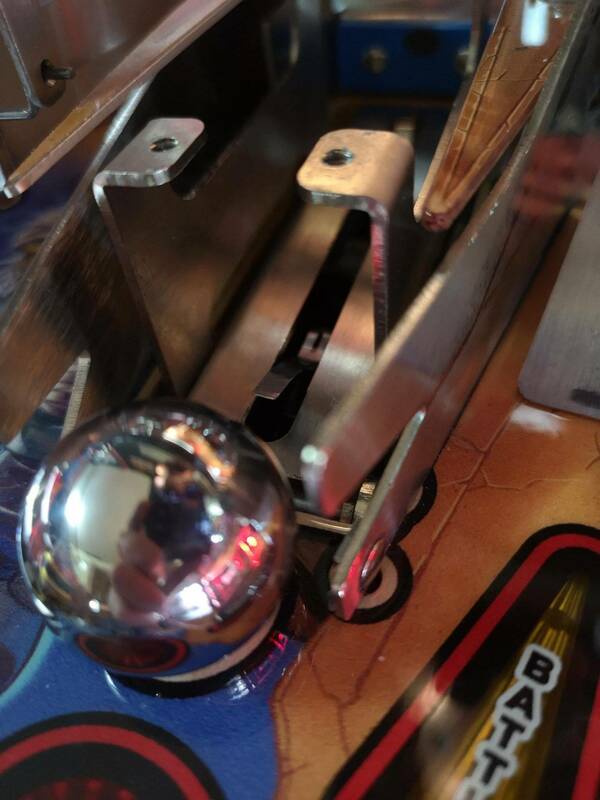 I have an old route operator's analog incline tool you place on the playfield and the dial shows you the angle. Failing that, you can download apps for your phone that measure incline, but they must be calibrated on a known flat surface, and even then they vary widely in accuracy, but it will get you in the ballpark. That said, if that's the way you go, run the app and take the glass off, then lay the phone on the PF at the bottom and the top. Take both measurements. 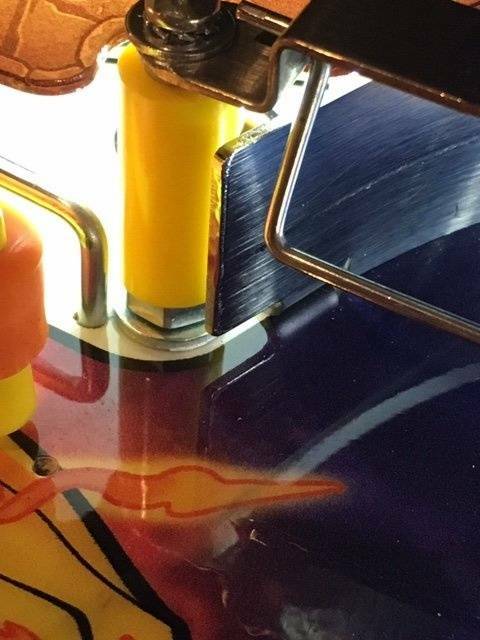 That will at least give you a rough idea of your playfield incline, likely within a few tenths of a degree (IF the app is calibrated on a known flat surface first!). they have a new ball guide for launch in testing but they will deny it. suspect this will roll into future games quietly. I just got a premium. I have had all the issues expressed here plus a new one (plunger barely makes contact with the ball). About 6 hours in on tweaking but its playing good. Wish qq was better but no regrets. I'm having this problem as well. I thought it was getting stuck on the switch there but you say it has more to do with the pf'd degrees! Hmmm, might check this. The pathway you say to angle slightly?? Can you explain what you mean in a little more detail please. Sorry to bump guys but I'm still getting this thud kinda sound? Any help at all? Did adjusting the spring help? I stretched the spring out and it helped a bit. It's quieter now, but still hear the thump. I'm worried that if I stretch it any more the flipper might start having issues returning to it's home position. I'd check the angle of your PF first...that's the most-likely cause (also make sure it's level left to right). 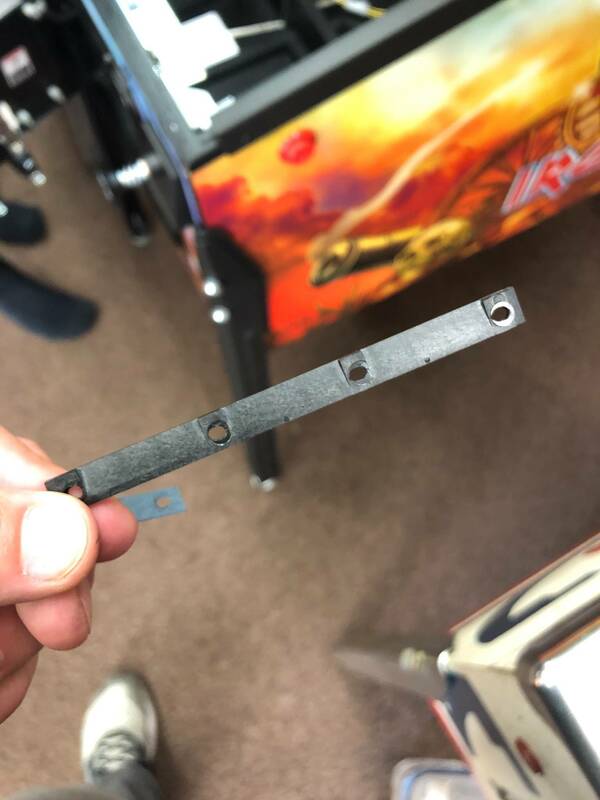 Mine was getting stuck on the switch arm, as this switch was super stiff (like the one I had to replace in the sarcophagus). I flattened it out a little and that fixed it. A roller switch would have been a better idea here. 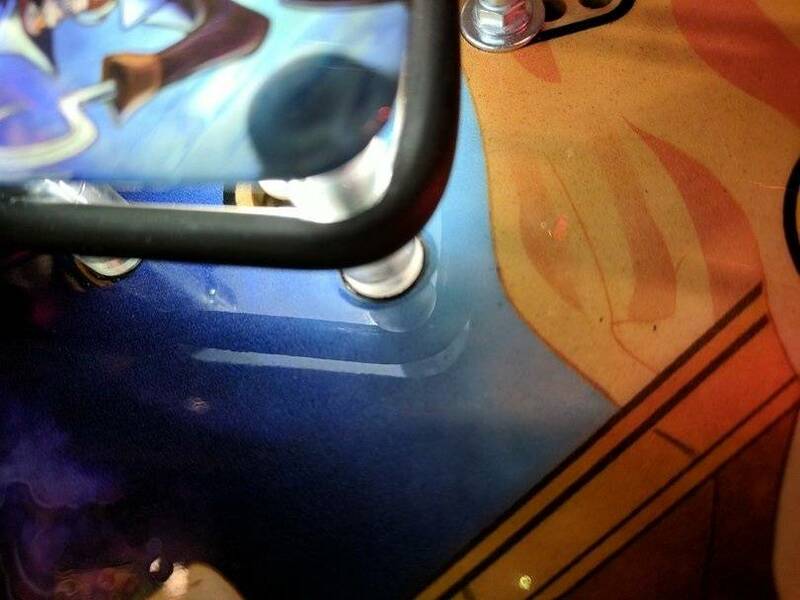 I was playing last night and all of a sudden I got a tilt even though I had not even nudged the machine. Happened again on the next two balls. Turned the machine off and on and played another game, 2 minutes in I get another tilt and I turn off the machine. Any idea where to look? The tilt bob is unobstructed and appears to be working properly. Shaker motor. Is it Stern? They had electrical issues when Spike came out where some of them would cause the machine to tilt even when they weren't running. Even if it IS Stern, it could be faulty electronics on it. Power off, unplug the shaker, and see if the problems persist. It came along with my shaker motor kit and I haven't had any issues with mysterious tilts. If it's a Stern or a Pinball Life shaker, they probably have a bad shaker. There was only tilt problems in the very beginning, then that was fixed. 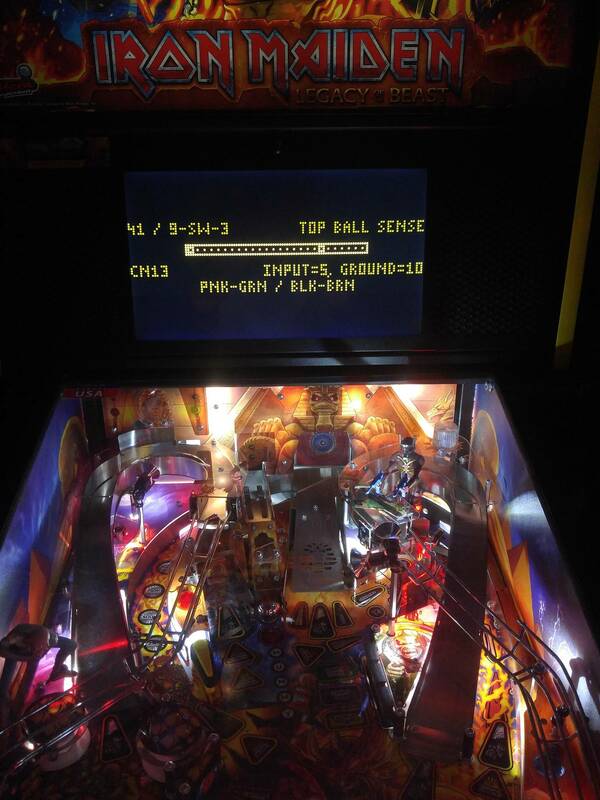 We use Pinball Life ones in most machines on the route and haven't had any problems. Thanks guys! This seems to be the problem! The targets will not reset. 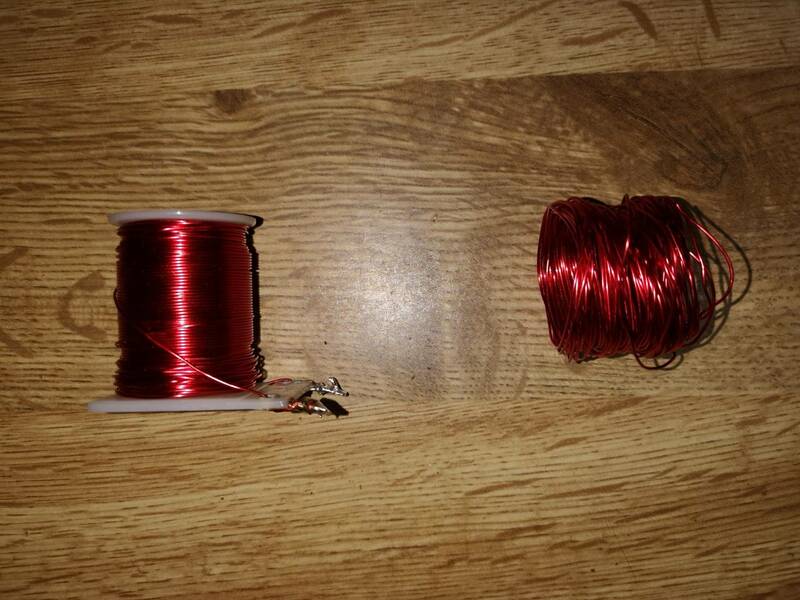 The coil will attempt to raise and reset them in short two attempt bursts throughout the game. When I run diagnostics and test the coil, it raises the drop targets fine. I loosened the spring that holds the targets a bit and that seemed to fix the issue briefly- but after about 10 plays it’s doing it again. 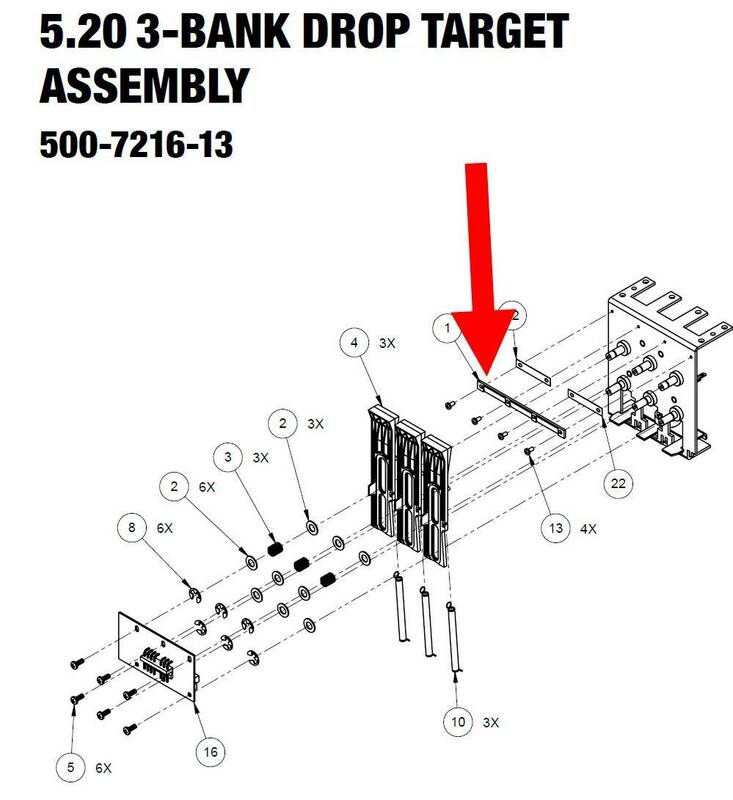 The most-likely problem is your paper-thin drop target shelf plastic has broken. 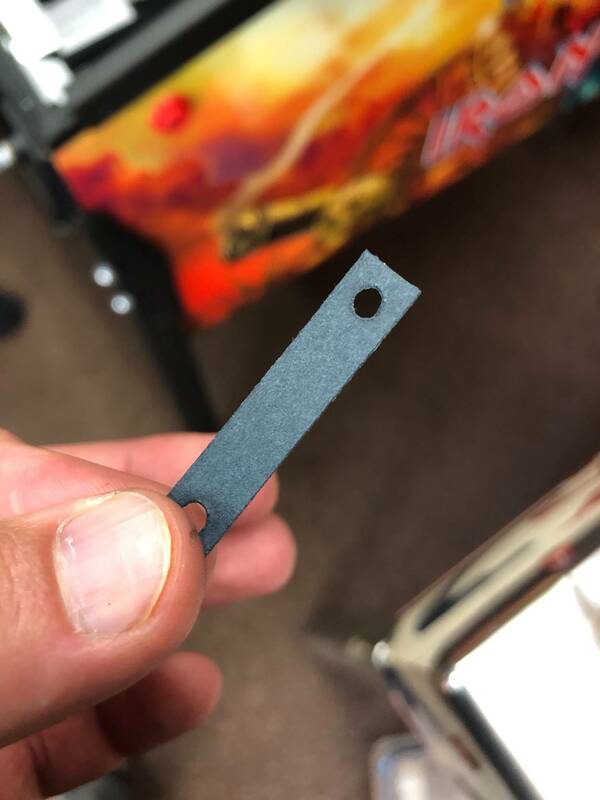 It goes onto the metal bracket and provides the "lip" for the targets to hang on to when they are reset. Check that - moving it with your finger to see if there is non-obvious breakage that only shifts under pressure. I've pointed the part out in the illustration from Stern's manual. So I removed the shelf to take a look at it and I found nothing wrong with the shelf (pic 1). However there is only ONE piece of paper- when there is supposed to be TWO (pic 2). Could that be the issue? That'll make it thinner by a tiny bit, I don't know if it's enough to make the targets not catch, though. Good news that it's not broken. That narrows it down to the missing paper gasket OR the springs not being tight enough (add a washer to each one to compress them with a little more force). I couldn't help but notice that someone wears shoes in the house, while another does not.